Two versions of October 2019 calendar for printing and coloring. One of them is totally blank and colourless, second (UK) has a little colors (Saturdays, Sundays and holidays). All versions with ancient dimetrodon. 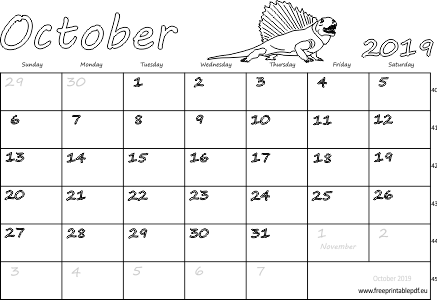 Just download, print and enjoy your own October calendar! May be used as monthly planners.